It only takes one glance to realize that the Tonka RC Ricochet is one of the most unique and original RC land vehicles released this year. It's 19" long and has 5" diameter tires with an incredibly low-slung design. It's so low, in fact, and the tires are so big, that it makes you wonder if it could drive upside-down. In fact, it can, by design. When you turn the Ricochet over, the underside even has another body on it of a different color. The construction of the Ricochet feels tough and well thought-out. Everything is pretty sturdy and the parts seem thick and strong. There's no antenna poking out of the vehicle to get snapped off or scraped up. Even the controller has an unusually tough design, with a thick flexible protecting sheath around its antenna that's can't get permanently bent or broken. It has tri-band technology, letting you select from three radio frequencies so you can run multiple Ricochets in the same area without interference, even if they're all the same color. The controls are semi-proportional -- there are three forward speeds plus reverse, and two steering angles. There's also a button you can press with your right index finger that will transform the Ricochet from low-slung street & stunt demon to high-riding monster truck. The way it executes this change is really unexpected, and you'll just have to check it out in the video. Included with the Tonka RC Ricochet is a 9V battery for that controller, a 9.6V rechargable battery pack for the vehicle itself, and a two-piece charger. The charger goes far above & beyond the norm amonst toy-class RC sets. Most chargers are just a power supply unit that you plug into the wall and battery, and they put out a small, fixed amount of electricity, called a "trickle charge." Because this trickle is never-ending, you have to disconnect your battery at the right time, when it gets warm to indicate that it's full, otherwise the pack will be over-charged, causing some degradation to the lifespan of the cells inside. The charger included with the Ricochet has a normal trickle charge unit to it, but you don't plug that part directly into your battery. Instead, there's a separate box that goes in between that will automatically stop charging the battery when it's full. The technical term for this is a "peak detection" circuit, sensing when the battery reaches its absolute maximum voltage. Thanks to this extra piece, battery charging with the Ricochet is 100% hassle-free and as safe as can be. You can put the pack on to charge in the evening and practically forget about it. Because of the big tires, I first ran the Ricochet on a bumpy dirt field. It was pretty fast had plenty of power to get over moldly to moderately rough terrain, but traction was a problem. The tires, though air-filled, are actually made of a pretty hard rubber, and they don't get good grip. The way the Ricochet steers is by completely bending in the center, rather than just steering the front wheels alone, and the result is that even at 1/2 steering input, it turns pretty sharply and with a lot of momentum. On dirt, even when you straighten out after a turn it wants to keep turning a bit, almost like it wants to spin out. It's then difficult to get it to go straight again without completely letting off the throttle to let it get settled. Even when I tried to put my 11 years of pro-grade RC driving experience to work it was still pretty difficult to make the Ricochet go just where I wanted. I then tried out the Ricochet's transforming ability and took it to a flatter gravel area and on an asphalt surface. It doesn't go any faster in low mode, but because it's longer, it's a little easier to handle when turning. The tires still don't have great traction a street surface, and with two-wheel-drive and plenty of power it will still powerslide & spin more than you want it to, but it's more controllable and fun than on dirt. It was interesting to discover that when the Ricochet gets flipped upside down, it won't steer as sharply as when it's right side up -- it will only turn at the half-steering angle. Surprisingly, this made it easier to control as less available steering makes it more difficult to spin out accidentally. The Tonka RC Ricochet is a tough vehicle that was definitely designed with a lot of thought and care. It's a little on the expensive side, but you pay for real quality. What a tragic shame it is, then, that the manufacturer made a very, very bad decision about just one critical component. The tires look great and are just the right size, but the use of a stiff, plasticky material utterly decimates the performance and enjoyability of the vehicle. Don't get me wrong. 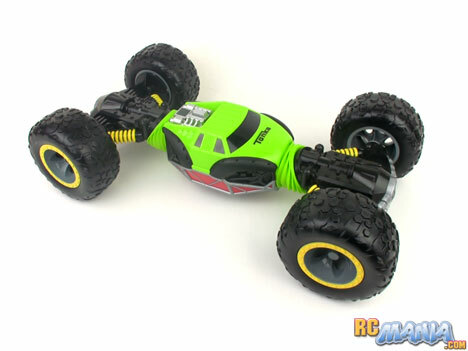 The Ricochet is a fast toy RC, it is fun, and the transforming & flipping abilities are awesome. Many kids will absolutely love it. However, by just using softer tires, the handling and driving experience would have been made at least 50% better, easilly propelling it deep into "grade A" territory. I hope that this is just the first in a series of new Tonka RCs, because the Ricochet is definitely a step in the right directly for toy RCs, with progressive and innovative features and a lot of durability. With just a tiny bit more attention to important details in a future revision, it could become a serious force in the world of action toys.